We think that Photoshop Elements 6 is one of the best values in Mac software (along with iLife 08). 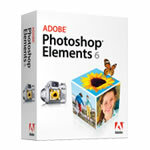 Adobe just announced Elements 6 for the Mac at a preorder price of $89.99 US and upgrade from $69.99 US. For those dollars you get a Universal Binary version of Photoshop that features many of Adobe's latest technologies such as Photomerge GroupShot, Faces, Web Galleries and improved tools for B&W and scrapbooking. Plus, you can even correct lens distortion. "New features based on proprietary Photomerge technology let users easily combine the best facial expressions and body language from a series of shots to create a single, perfect group shot. The new Quick Selection Tool reduces a once time-consuming select-and-adjust task to a single click. Photographers – beginner to expert – can choose from one of three edit modes, each geared toward a different experience level. A new Guided Edit mode helps walk users through the steps of improving a photo. Photoshop Elements 6 software streamlines editing with clean, uncluttered screens that draw focus to the photos, with new tabs providing simple access to the many capabilities of the program. Additional enhancements include an improved conversion tool that dramatically converts color images into elegant, nuanced black-and-whites." I was wandering around the The Florida Aquarium in Tampa last night for the Kodak-sponsored Closing Night Party at Imaging USA. Since it was a photography show, it's safe to assume that most of the attendees were shooters. I was amazed at how many people did not know how to shoot exhibits at an aquarium. So I thought it might be time for a refresher. This technique applies to shooting through hotel windows and portholes on airplanes too. Turn off the flash. (all it's going to do is cause reflection in the glass). Increase your ISO (for aquarium and museum shooting) to 400 or above. Look for a subject that isn't moving too fast. You're not going to engage in action photography here unless you switch to movie mode (which is also fun!). Find a clean place in the glass, and put the nose of your camera right against it. This eliminates reflections from your surroundings. Shoot in Raw if you have it. You'll most likely have to do a little image cleanup when you get back to the computer. Don't worry about bad shots. You'll have some loss for this type of assignment. But the keepers will be outstanding! All types of water shots are fun. I was lucky enough to see Howard Schatz this week and learn how he did those amazing dancer images underwater. Aquariums also provide great opportunity. Apply this technique, and you'll come home with a prized shot. 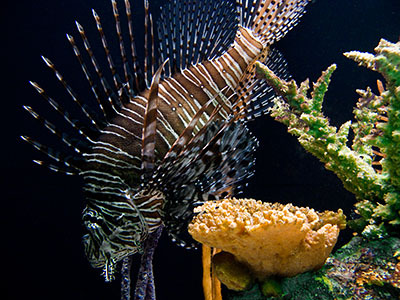 Photo of Lionfish by Derrick Story, captured with a Canon G9, ISO 400, f-2.8 at 1/6 of a second. Processed in Adobe Lightroom. "We love everything about printers, paper, ink and printing. We have been playing with them, writing about them, and using them for more than two decades, so we like to think we know more than a little bit about them. Of course, the world of printers is a big one, and we’ve chosen to focus largely on photo printers for amateur and professional photographers." Rick launches the site with a news piece about the new Epson R1900. "The R1900 uses a reformulated inkset, called UltraChrome Hi-Gloss 2, consisting of eight individual inks: the gloss optimizer, matte and photo black, and cyan, magenta, yellow, red and orange. Epson claims that the orange ink, which replaces blue in the original Hi-Gloss inks, increases the printer’s overall gamut and provides improved flesh tones, while the new formulations of magenta and yellow inks improve the blues and greens, respectively, in most prints." If you love printing too, or just want to keep up on everything in the world of output, be sure to spend some time over at Printerville. I think it's going to be a terrific resource for all of us. Regardless if you're using Lightroom or just managing files on your own, a good file naming convention that you can apply to your pictures on import will help you stay organized. In his Imaging USA session, "Organizing: Asset Management in Lightroom," Seth Resnick provided this tip. Regardless of which method you embrace, now, at the start of 2008, is a good time to establish a useful file naming convention that you can use going forward. About the photo... 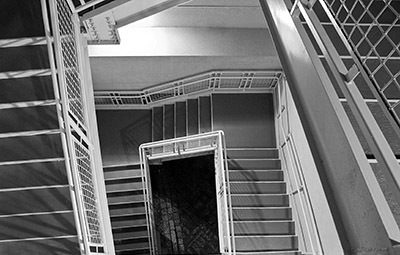 I captured this with a Canon G9 while walking down a stairwell in the hotel. I used a GorillaPod to steady the camera during the .8 exposure. I keep the ISO to 80 and converted the image to B&W in Lightroom. Lots of interesting stuff going on today at Imaging USA. I'm going to sit in on a Seth Resnick talk, "Organizing: Asset Management in Lightroom." I haven't had a chance to listen to Seth since he's moved from his management system to Lightroom, so this should be fun to hear how one of the DAM masters leverages Adobe's latest photo software. I'm also looking forward to Katrin Eismann's talk on "The Power of Camera Raw." Katrin has a new book out, The Creative Digital Darkroom that looks just great. I have a copy at home that I can't wait to dig in to. And of course, the Expo opens today with lots of high profile exhibitors. I want to get my hands on the new Nikon D3. It looks terrific on paper. I took this photo last night while walking home from dinner. There's plenty of water in Tampa, and it makes for good night shooting, especially when you get some interesting skies to boot. I used the Canon G9 resting on the railing of a bridge (yes, I held on to the strap). With the self-timer on, I manually set the exposure to 15 seconds at f-2.8 keeping the ISO to 80 to control the image noise. I then processed the picture in Adobe Lightroom. 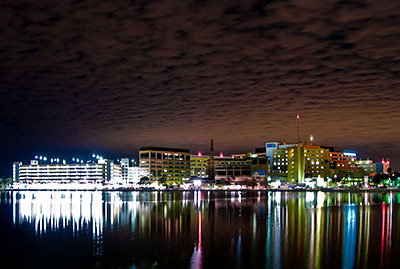 Photo of Tampa Night Reflections by Derrick Story. Here's a fun project if it's miserable outside and you want to play with your photography. Find an old pair of corrective glasses for farsighted eyes, and make a do-it-yourself fisheye lens. You can read all about, complete with instructions, at Photojojo, (which is a great site anyway for a rainy day). 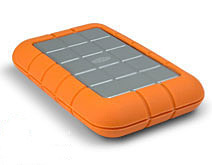 I've spent a lot of time lately backing up my portable drives, making sure my big drives are in order, and getting my photography act together for 2008. I've decided to close out my Aperture and Lightrooom libraries for 2007, and begin fresh libraries for 2008. I still carry my 2007 libraries with me on portable drives, and of course have them backed up in multiple locations. This is a great time of year to get your digital house in order. I cover more of this stuff in this week's podcast, Getting Organized. 2008 will be our best workflow year yet! As of Jan. 1, 2008 on U.S. flights, if you pack a spare Li-Ion battery in your carry-on luggage, it has to be in a plastic bag or in the original packaging. Here's the verbiage from the Department of Transportation. You can find out more by visiting the SafeTravel.dot.gov. Is Image Noise Always Bad? The topic of image noise often surfaces when we talk about shooting at high ISOs with compact cameras. Usually the conversation veers in the direction of trying to prevent the noise and devising workarounds toward that goal. But, is image noise always bad? When I was a film shooter, one of the reasons why I liked TRI-X B&W film was because of its grain pattern. I would often use this film in situations where I thought the grain would add an artistic element to the composition. Because the light was low, I had to up the ISO to 800 to prevent camera shake. Even at 800, the exposure was made at 1/50th @ f-2.8 while holding the camera in one hand. I knew there would be grain, and I'm OK with it here. When I return home, I'll make a couple big prints to help me better evaluate the image. But my first impression? Image noise isn't always bad. 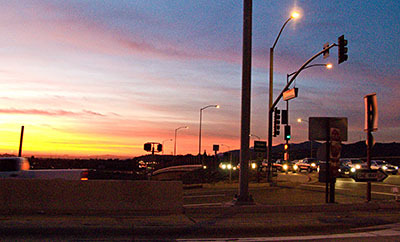 "Twilight Intersection" Photo by Derrick Story with Canon G9. Winter presents some graphical opportunities for photographers with a keen eye. The combination of angled light with various forms of precipitation can make for some interesting abstract compositions. Now that you've captured snapshots of family and friends during holiday gatherings, turn your lens outward and see what you can find. 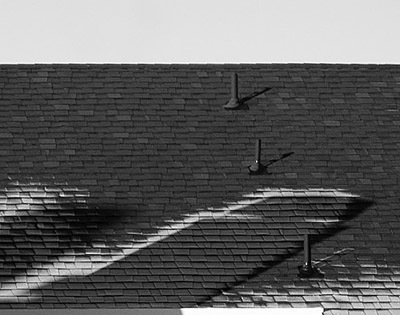 This shot of lingering frost in the shadow of a chimney was recorded with a Canon G9.